115/200 VAC 400Hz Aircraft Cables - Aviation Ground Equipment Corp.
Aviation Ground Equipment Corp. offers a wire array of 400Hz aircraft ground power unit cables to fit all of your needs. From standard cables, to cables designed to meet your specification. We offer a variety of single jacketed cables for 400Hz 115/200 VAC applications including MIL-STD type cables. Cable meets or exceeds the electrical and environmental requirements of SAE AS5756 (former MIL-C-5756). Cable head meets or exceeds the electrical and environmental requirements of SAE AS7974 (former MIL-C-7974). 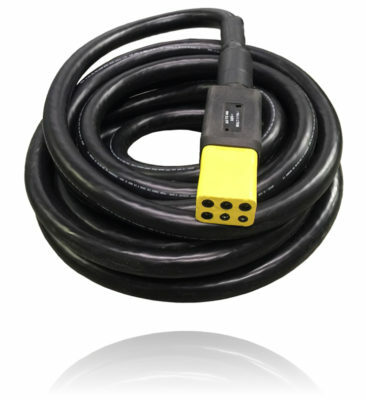 All 400Hz Cables are single-jacketed, rated at 180A, 260A or 300A. Standard cable lengths are 20,30,40,50 and 60ft with custom lengths available. Cables are available in Male, Male/Female (extension cord), Female/Female, Dual-Headed or Pigtail. Hobart replacement 400 Hz AC GPU (1/0) cable part numbers 402032-002, 402032-003, 402032-004, 402032-005, 402032-006. Hobart replacement 400 Hz AC GPU (2/0) cable part numbers 402034-002, 402034-003, 402034-004, 402034-005, 402034-007. Tronair/Arvico 400 Hz AC (1/0) Output Power Cable Assemblies, part numbers EC-1887-30, EC-1887-40, EC-1887-50, EC-1887-60. Tronair/Arvico 400 Hz AC (2/0) Output Power Cable Assemblies, part numbers EC-1814-30, EC-1814-40, EC-1814-50, EC-1814-60. Current Power (1/0) Cable-400-30-1-0, Cable-400-40-1-0, Cable-400-50-1-0, Cable-400-60-1-0 GPU cable assemblies with aircraft connectors. Current Power (2/0) Cable-400-30-2-0, Cable-400-40-2-0, Cable-400-50-2-0, Cable-400-60-2-0 GPU cable assemblies with aircraft connectors. Other part numbers (1/0) MS90328-25, AN3430-1A, AC4-1020C, CTC90328-31, CTC90328-25, 1688-0151-0020, MS90328-26, CTC90328-26, R67G5E-20, R67G5E-30, AN3430-5, 1688-0151-0030, AC4-1030C, MS90328-27, CTC90328-27, AN3430-2A, R67G5E-40, AC4-1040C, 1688-0151-0040, MS90328-28, CTC90328-28, AC4-1050C, CTC90328-01, 1688-0151-0050, R67G5E-50, R67G5E-60, 1688-0151-0060, AN3430-7, AC4-1060C. Other part numbers (2/0) MS90328-31, CTC90328-31, 1688-0101-0020, MS90328-32, MCPAC-20, MCPAC-30, 1688-0101-0030, CTC90328-32, R67G36E-20, R67G36E-30, AC4-2020C, AC4-2030C, MS90328-33, 1688-0101-0040, MCPAC-40, CTC90328-33, R67G36E-40, AC4-2040C, 1688-0101-0050, CTC90328-04, AC4-2050C, MCPAC-50, MS90328-34, MCPAC-60, CTC90328-34, 1688-0101-0060, R67G36E-60, AC4-2060C.